Now, more than a year later, we have started our search again having been held up by our two retirements from our schools, the wedding of one of my daughters, and sundry other events. On the day we crossed that part of Lake Superior, it was gorgeous! The sun shone brilliantly and made the autumn leaves glow. The wind was chilly, however, but, thank heavens, the water was not choppy. We have heard of a one-room school still in existence in Wisconsin, the only one, in fact. It is located on the largest of the Apostle Islands in Lake Superior's Madeline Island. We arranged for a day when we could visit the school in session. The trip up to the island took us most of one day so we reserved a very nice room in a Super 8 in a quiet, small town just short of Bayfield, the ferry docking place for the trip across to the island. Next morning we were there early to load our car onto the ferry boat. The boat looked smallish and frail but it loaded people, cars, and finally a tour bus. The trip across to the island took about 20 minutes. In winter before the water is solidly frozen and when the ferry boat can no longer operate, the trip is made by a wind sled, a sort of amphibious craft. The school children who live on the island and go to high school on the mainland take that trip twice a day, a trip that can be treacherous. After the ice is solid enough, a road is plowed and lined with recycled Christmas trees to mark the trail. The "ice highway" as it is called is then an extension of a county trunk road. After unloading our cars and the bus which took only a few minutes, we got directions to the school, mere blocks away. The village, La Pointe, is the only town on the island but has what most every town has -- post office, police station, church, library, restaurants and a few shops. I do not remember seeing a grocery store, however. No doubt, the ferry, wind sled and cars bring islanders and food from the mainland. The school itself does not look like a typical one-room school and, indeed, we found it was actually two rooms. 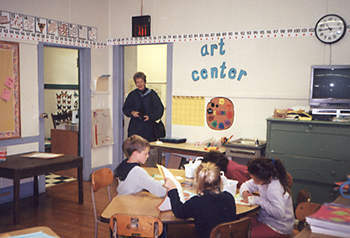 About four years before, it turned one of its additions into another classroom since enrollment had increased to eighteen students, from kindergarten through grade six.There was a teacher for each classroom and one aide. The teacher for the older pupils, grades 3-6, lived on the island for 20 years and the other came over from the mainland daily. When we arrived the older students were in music class with a teacher who apparently came in just to teach music. Besides having an actual library of mainly paperbacks, there were encyclopedias and other hard cover sets of books. Three computers were available for the students, used for word processing and internet. The teacher said that sometimes the students come to school at 6:30 a.m. so that they can talk to other schools in different time zones. There is a lot of internet use for science classes, also. In all ways, it is a modern school but recess is much like our old rural one-room school with all the students out on the playground together. From the littlest kindergartener who is a special ed boy to the biggest, huskiest sixth grader, all were playing kickball together though the little guy had to be told often which way to run. This playground was laid with new asphalt in contrast to the grass we played on.There was a large sandbox area and modern swings and other typical playground equipment. Also, the teachers were out supervising the children at play which was a departure from the recesses I knew at our school back in the 1930s. Then it was a treat for us for our teacher to come out and join us in a game of baseball, our favorite recess activity. Of course, it is now a state law that children must be supervised at all times when in school. We spent a short time in the K-2 classroom after the children came in from recess. The teacher told them to continue to write in their journals. We learned that La Pointe school was built to replace another school which then became the town library complete with two entrance doors, "one for boys and one for girls". The library was closed until the afternoon. On the porch and around on the lawn stood a couple unlocked bicycles, an amazing sight for someone coming from the big city. We found also a third school building which looked more like a typical one-room school. It had been moved in from the upper end of the island sometime after the current building was put to use, and is basically a museum. Unfortunately, there was nobody around who could open it for us so we settled for peering in the windows and taking a few photos. On our way back from northern Wisconsin, we stopped in Wild Rose at the one-room Progressive School which is in a museum setting, also. It is open on Wednesdays and Saturdays only so we had to snoop in the windows and shoot a few pictures. We plan on returning there; it is about a three-hour drive. Friday, October 13, 2000 we found ourselves at Aztalan State Park near Lake Mills through the kindness of its caretaker who opened the one-room school building just for us even though it had closed for the winter season. It is part of the Aztalan State Park and sits just a short distance from the original building which burned down in 1918 and was replaced by the current structure, a red brick building which looked substantial and in good repair. The room held its pot-bellied stove, crockery drinking fountain, a variety of student desks, a world globe, and a locked cabinet of antique books, both texts and library books. On the teacher's desk were old bound copies, sort of ledger types, of school records indicating student names, attendance records and so forth. On loose papers inside the ledgers were records requesting information of the teacher regarding her (the signatures indicated all were women) own preparation for teaching. All had just four years of schooling beyond 8th grade. One teacher had begun further school after high school but had not been able to complete it. There was a question asking if a School Society existed in the school. Each teacher had written that there was none in existence because "the students were not capable", or "the students are too young". There was no explanation of the purpose of this organization.